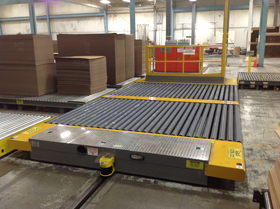 Our standard Chain Driven Power Conveyor has rollers spaced on 4” centers and is used to ensure positive drive. A version of this unit is also commonly used for a Baler Discharge. The rollers are spaced on 6” centers to allow pieces of scrap that would usually get stuck in a standard Belt-Driven Conveyor, to fall thru the Conveyor onto the floor. CDLR is shown on a Transfer Car. Drive: 1 hp totally enclosed industrial rated 1750 rpm gear-motor with reversing capability. Drive Package located within and under the device. Chain Driven Rollers: Heavy Duty 3-1/2” diameter wall thickness Rollers spaced on either 4” or 6” centers. Rollers include a 1” diameter C.R.S. shaft, mounted in a 2-hole flange bearing (re-greasable). Rollers are mounted in a 4” x 3” structural angle sideframe. Load rating is 750 lbs. per roller. 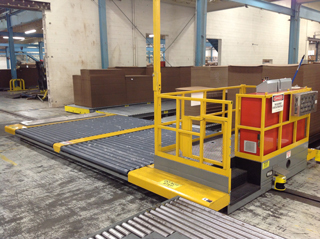 Roller Width 30" 36" 48" 60" 72" 84" 96"
OAW 42" 48" 60" 72" 84" 96" 108"
Preassembly: Unit is wired at the factory. Unit Height: 12” TOR minimum with Leg Extensions available for other heights.